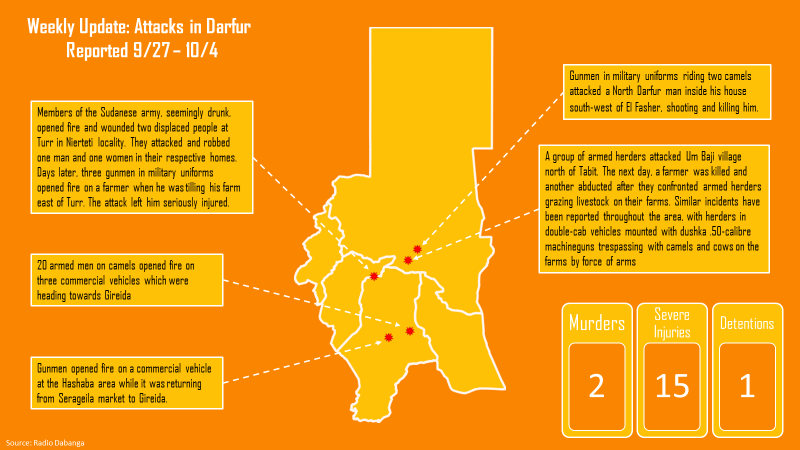 Despite Sudanese government false claims of peace in Darfur, this week once again saw massive violence against civilians, both from unofficial militias described as “herders,” and regular Sudanese military forces. 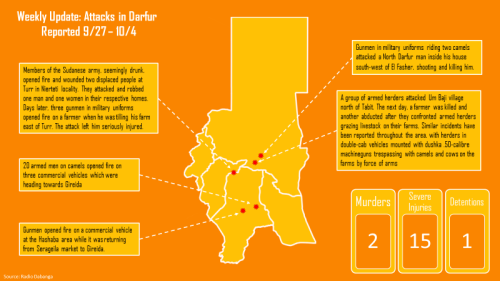 The pattern of both groups targeting the same victims, in the same types of attacks, should serve as a reminder that Government forces and militias in Darfur work hand in hand to terrorize the indigenous African farmers throughout Darfur over a decade and a half of genocide and ethnic cleansing. In Central Darfur, Sudanese army soldiers broke into two civilian homes in Turr IDP camp, brutalizing and robbing the inhabitants. In a gruesomely similar incident, uniformed military personnel attacked a North Darfur man in his house near El Fasher, shooting and killing him. Farther south near Gireada, “armed men” fired on commercial vehicles in two similar incidents, killing or wounding 13 in total. North Darfur also saw a continuation of a long campaign in Darfur, whereby farmers are removed from their land by force of arms. In outlying villages around the Tabit area of Dar El Salam and Tawilla, “herders” riding in vehicles mounted with .50-calibre heavy machine guns have trespassed on farms to allow for herds of cattle and camel to pass. At least one farmer has been reported killed, and the entire village of Um Baji was reportedly sacked. Government forces, ostensibly present in the region to “protect” farmers from such intrusions by herders, ignored repeated requests for this very same protection. Make no mistake, the “herders” in vehicles mounted with heavy military equipment are armed and backed by official government policy, working in tandem with uniformed Sudanese military personnel in a campaign of Genocide against the Darfuri people. In many unfortunate instances, farms turned into pasture by years of war and forced displacement are now occupied by settling herders, who target Displaced People seeking to return to their land. This is the environment which President al-Bashir claims is safe for the return of the Darfuri people, a project for which he has recently won international accolades. With violence continuing against civilians in Darfur, the so called “Voluntary Return” program is a sham project. The people are not safe, and genocide continues. It is our moral obligation to speak up and to hold our leaders accountable, to force them to take action against the perpetrators of these crimes in Darfur. Register for our Symposium “Women and Genocide in the 21st Century: The Case of Darfur” here, to hear from survivors and scholars of genocide, and learn how you can make a positive impact on ending the 15-year suffering of the Darfuri people.